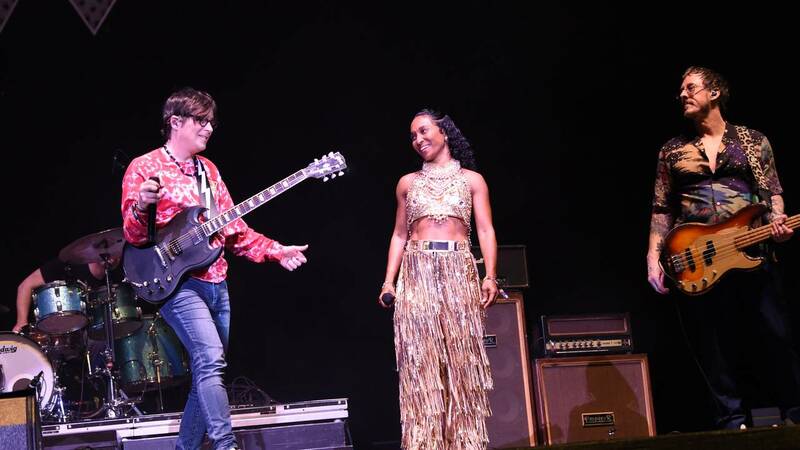 Rivers Cuomo of Weezer, Rozonda 'Chilli' Thomas of TLC and Scott Shriner of Weezer perform at Coachella Stage during the 2019 Coachella Valley Music And Arts Festival on April 13, 2019 in Indio, California. Weezer surprised fans back in January when they released "The Teal Album," an entire album of cover songs. On Saturday at Coachella, the alt-rock band took two of the songs they covered to the next level. Tears For Fears came onstage to play their 1985 hit "Everybody Wants To Rule The World" with Weezer. Weezer also brought out Chilli, aka the C in TLC, to perform the '90s classic "No Scrubs." People on the internet had a lot of opinions about Weezer taking on the classic when it first came out, but the haters don't get no love from Chilli. She told Rolling Stone in January she loved their take so much she wanted to perform it together. If you didn't make it to Coachella, no worries. This might not be the last time we see a TLC and Weezer collaboration. After the show, the two had this Twitter exchange. "Thank you Chilli from @officialtlc for gracing our @coachella stage last night for "No Scrubs"! Such an honor!" the band wrote. "Thank u @weezer it was so much fun!!! See u guys at the #TLC concert." she responded.